We recently spent an extended weekend on Washington's Olympic Coast. Before heading out, we searched for overnight accommodations. 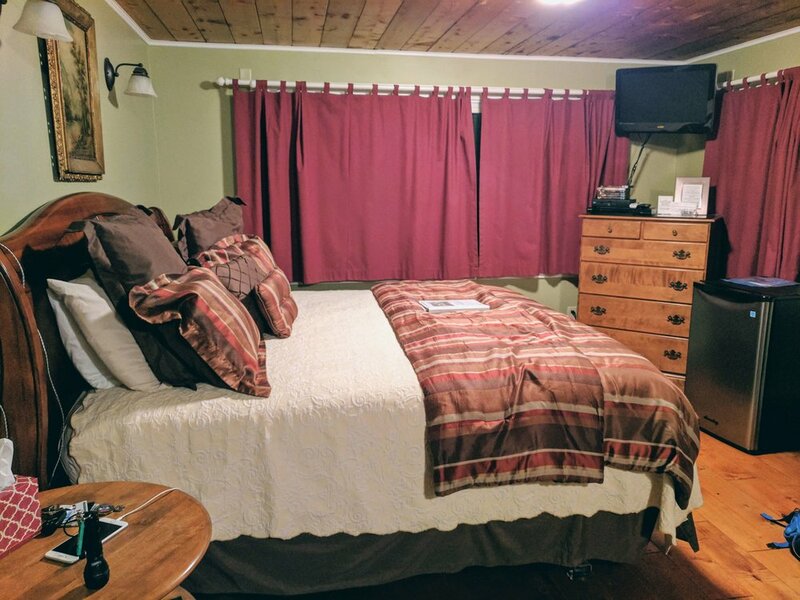 After reading many of the positive reviews, 52 of them averaging out to 4.7 of 5 stars, we decided that the Miller Tree Inn Bed and Breakfast was going to be our home away from home for the next couple nights. 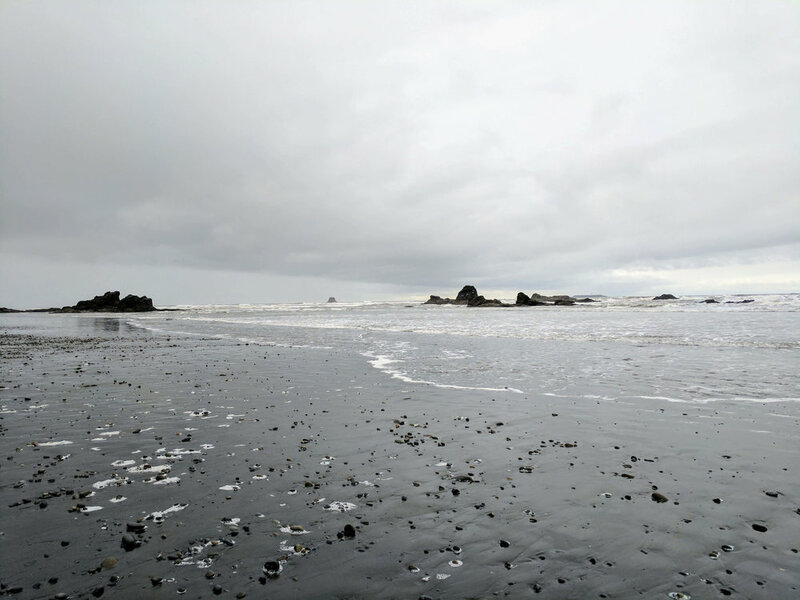 The scenic coastline and forests of Forks and La Push certainly demanded more than one day of our attention! Built in or around 1916, and operating as a B&B for 20 years now, the Miller Tree Inn is located in the very rainy city of Forks, Washington. As some of you may be well aware of, the town is known for being the home to a well-known vampire family of novel and movie. Upon arriving, one may notice the name "Cullen" on the mailbox or see the whiteboard near the front door that mentions "The Cullens are taking an extended around the world holiday..." The Miller Tree Inn is the official "Cullens home" due to its similarities to the home in Stephanie Meyer's Twilight. There are much more fan memorabilia inside the house as well as throughout the rest of the town. Personally, we were never huge fans of the series. However, we did not let that deter us from choosing to stay here for the next few days. The inn is much more than a tourist attraction. Our host was accommodating, kind, and made us a delicious vegetarian breakfast (at our request) each morning. The overall feel of the place was homey and relaxing. It has eight rooms, and there were many other guests during our stay, but we barely noticed or heard them. Check in was from 4:30 pm to 7:30 pm, we arrived right at 7:30 due to the long drive from the city, as well as an out-of-the-way detour we made to Cape Flattery. 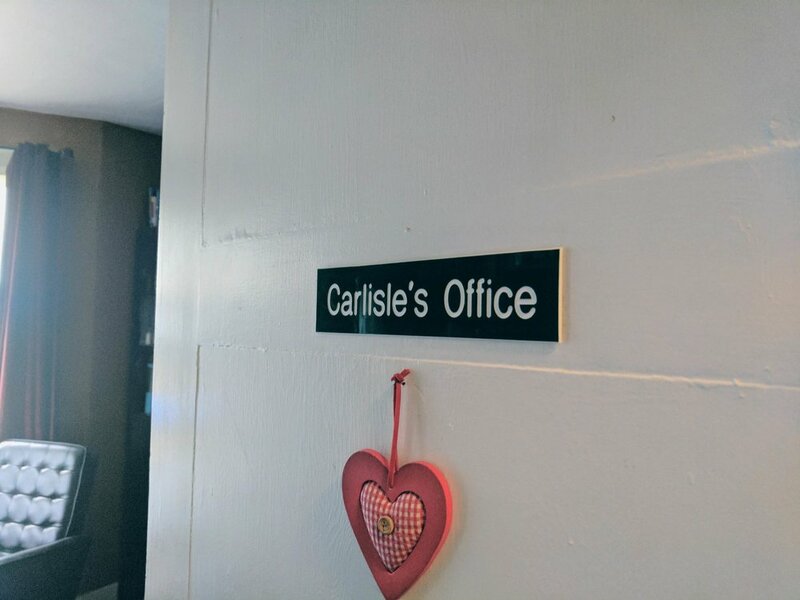 We were welcomed in, shown to our room, and offered cookies downstairs in the common area. We unpacked our bags, looked over the room, and relaxed a bit. Our room, the Cedar Creek Room, had a king size bed, TV with DVD player, mini-fridge with complimentary juice and soda, an additional day bed, and bathroom with a jetted garden tub. There were very large windows facing north and west with a view of our vehicle parked at the front of the house. Moreover, atop the DVD player was the full series of the Twilight discs. The Inn did provide a broad array of DVDs in the common area, free Wi-Fi, a side door only accessible for guests to come in and out, and a key to our room to lock while we were away. After relaxing a bit, it was now time to find some food. The cookies sounded good, but we had been snacking all day long during the drive. We needed something more substantial. After a quick search on Google Maps, we located and drove to Pacific Pizza, which was just down the main road in town. As we drove through the town, we noticed how quiet it was. Not many people out and about. Every store we passed was nearly empty. We wondered how the pizza place would fare. It turned out; it was pretty busy. It had to be the most popular spot in town that Saturday night. We ordered a medium sized veggie pie, and it was great. We headed back to the inn, watched a couple of movies, and fell asleep. We woke around 7 and made our way to the common area for breakfast. There was a handful of other guests already there. We took a seat at an available table, and our host came by double checking with us that we were the ones who requested a vegetarian breakfast. Moments later we had lovely plates of eggs Benedict with spinach replacing the traditional Canadian bacon. After breakfast, we made our way out to the shores of La Push. It was about a 25-minute drive from the Inn. It was rainy and windy at the shoreline. We explored the beach for awhile but opted to leave earlier than we planned. Our next stop was Bogachiel State Park, about 13 minutes south of Forks. To our knowledge, this is the only state park in this region of Washington. We were eager to check it out and add it to our list of visited state parks. The park provides camping grounds and a few day use picnic tables. It is nestled up to the Bogachiel River on one side, and the busy and noisy U.S. 101 on the other side. Unfortunately, we were not all that impressed. We could not imagine wanting to camp here with the sites so close to the road. We did take a stroll through the very short trail and found it to be relaxing. 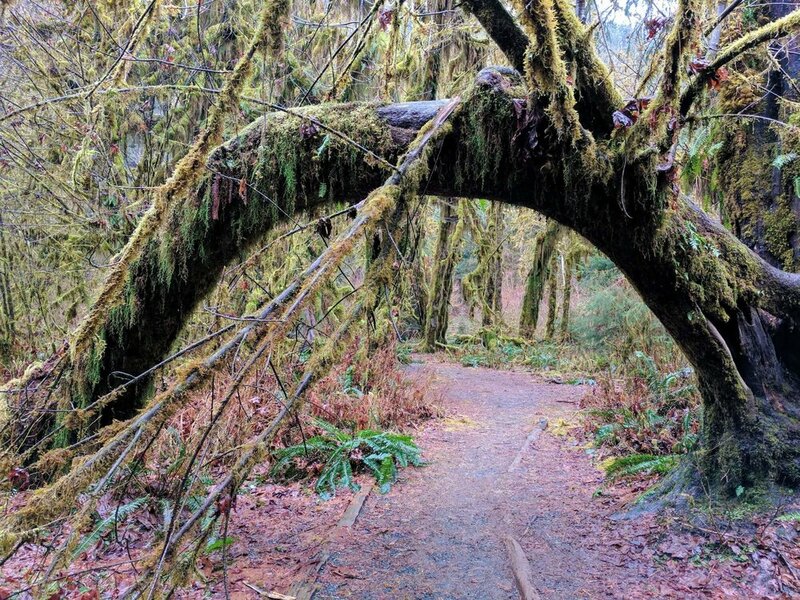 Up next was the Hoh Rain Forest in Olympic National Park. About a 45-minute drive further than the state park. The majority of the ride travels along the scenic Hoh River. There are plenty of spots to pull off the road for photos of the river and the nearby frosty mountains. Once we reached the parking lot, we continued to the Hall of Mosses Trail. 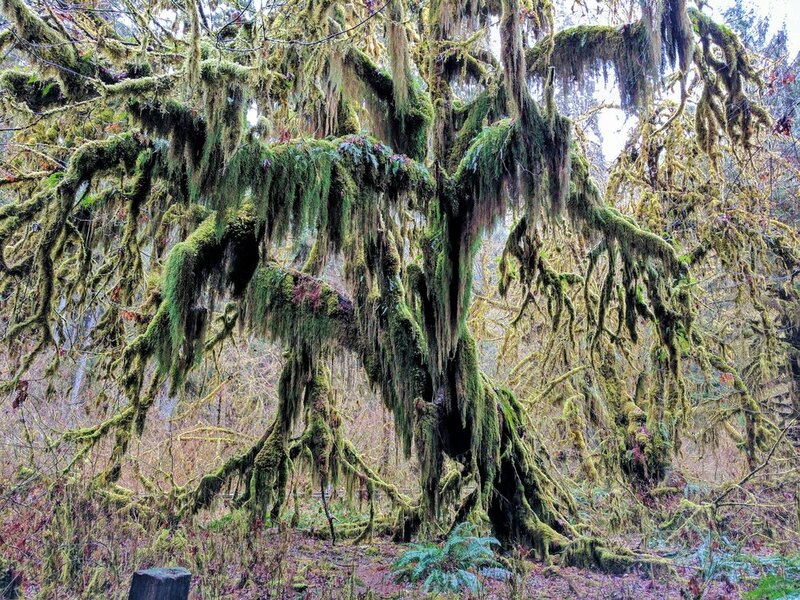 Hall of Mosses is a short looped trail, appointed with trees carpeted and dripping in moss. The rain was starting to come down a bit harder now. We would save the other trails for another visit. On the way back into town we stopped at the Blakeslees Bar and Grill for a late lunch. Their veggie burger was delicious and came with a good amount of fries. Add a couple of beers to that meal and our tummies were happy! Back at the Inn we cozied into bed and watched a couple of movies that night. The next morning was like the last. We headed to the common area for a bite to eat. Today's menu offering was croissant French toast with warm orange syrup and bacon. We skipped the bacon, but eagerly devoured the French toast. We explored the old house a bit more, took some photos, and then checked out. We headed out to Rialto Beach, just north of La Push, on the other side of the Quillayute River. Rialto Beach was a very rocky beach with quite a few people already out exploring. We walked the shore a bit then headed off. Next stop was Ruby Beach. Here, a short trail descends from the parking lot to the beach. It was still raining, but that did not stop a good-sized crowd from visiting. It was the afternoon now, and we were still far from home. We decided to pass on visiting Kalaloch and Lake Quinault. We would save them for another time. Though our trip did not include as much hiking as we wanted, we were still quite happy, and we had an exquisite time. The Miller Tree Inn was more than we expected. If you are in the area, consider staying for a night. Twilight fan or not, the Inn is an enjoyable stay. The Miller Tree Inn was hosting guests long before the Twilight series.